Day I: Leave Nairobi around 9:00a.m across the central highlands to Naromoru youth hostel about 3hour drive.Dinner and overnight. Day 2: After breakfast leave to Naromoru gate. One hour driving by a 4wheel drive arriving at the gate around 11.00 0'clock in the morning. We check in here and start hiking following the crest of broad ridge between Naromoru valleys northern and south 9km walk dinner &overnight at Met station. Day 3: Trekk 14km 5-6hours 1150m ascent. After breakfast, head uphill pass the radio mast on your right. After this point proceed through the vertical bog, reaching Teleki valley and Mackinders camp 4300m. dinner & overnight. Day 4: This is acclamatization day which involves a hike up to the two tarns[4450m]. Walk back to mackiders camp via the American camp. Dinner&overnight at mackinders. 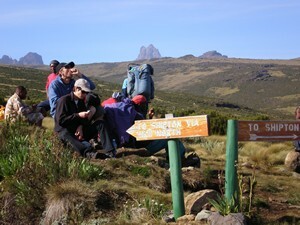 Day 5: Mackinders camp to point lenana 5km 3 1/2 hours 785m ascent ,The usual way of doing this stage involves a start around 3:00a.m to get to the summit of point lenana 4985m by sunrise. After sunrise descend to Shipton camp4200m for full breakfast.Then desced to old moses camp 3300m7hrs for dinner&overnight. Day 6: Old Moses to Sirimon Gate after breakfast,walk for two hours to connect a transfer back to Nairobi. Day 1: Leave Nairobi at 09.00 am to Nanyuki on 3hr drive. Arrive at 12.00 oclock lunch time. After lunch, proceed towards the dense forest for a nature walk to mau-mau caves,14 km, dinner and overnight at the campsite. Day 2: Leave at 8.30 hrs after breakfast to sirimon gate, 1hour drive and drop off at the gate. This is where the trekk begins. Walk 9 km to old moses camp,dinner/overnight. Day 3: After breakfast, leave at 7.30 hrs to shipton,a long walk which will take 6-7 hrs,up and down the hills, dinner/overnight at shipton 4200 metres. Day 4: We will spend another night here for aclimatization. On this day we will be walking uphill and return to the camp,dinner/overnight. 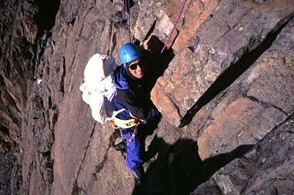 Day 5: Wake up at 2.00 at night and have tea and biscuits and leave at 3.00 to the summit. This is a hard climb to summit,3 hours walk, arriving at 6.30 in the morning for the sunrise.This place is point lenana 4985 metres, kilimanjaro is visible if the wheather is clear. After taking photographs we will descend down to mintos hut for breakfast. 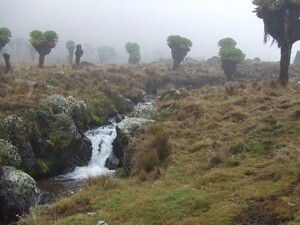 Then descend up the gorges valley to chogoria bandas, dinner/overnight. Day 6: Descend down after breakfast through bamboo forest half way and connect with your 4 wheel drive to chogoria town, then leave to Nairobi. Leave Nairobi to Nanyuki across the equitor,arriving in the afternoon,after lunch proceed to the rain forest for the nature walkand then return to the camp for dinner/overnight. Proceed to Sirimon Gate for 2 hrs drive and then start hiking to Old Moses camp 3,300m. This is 10 km dinner/overnight at Old moses camp. After breakfst,proceed across Ontulili river straight to Liki North river to the top ridge and down to mackinders valley to shipton camp.The walk takes you 6-7hrs,dinner/overnight. After breakfast,start ascending through Simba COL,a steep ridge which takes you 1 hour to climb via Simba tarn approaching Delamere peaks and down to Austrian hut 4,790m,dinner/overnight. Leave at 5.00 in the morning and start ascending across Lewis glacier to Point Lenana,arriving at 6.30 in the morning for the sunrise.From this Peak,you will be able to see kilimanjaro. Then descend down to mackinders camp 4,300 for your breakfast. After breakfast,descend down to Met station 3,050m,where the walk takes 5hrs,dinner/overnight. DAY 6: Depart at 7.30 in the morning through the rain forest.This is 9km walk which takes 2hrs to the Gate,then transfer back to Nairobi,arriving at 4.00. Day 1: Leave Nairobi by a Safari Vehicle accompanied by our mountain guide for lunch. Spend the remaining part of the day acclimatizing due to the sudden change of altitude. Dinner and overnight at a hotel in Nanyuki. Day 2: Transfer from Your Nanyuki after breakfast to the Sirimon gate where the climbing starts. Walk through the rain forest for 9 kms (5 hours walk) to the first mountain hut - Old Moses (3500m)for dinner and overnight. Day 3: After breakfast in Old Moses, continue climbing through Mackinders Valley to the second hut Shipton hut (4200m) for dinner and overnight. 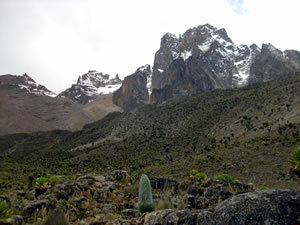 Day 4: Early in the morning, we climb to point Lenana 4985m(17,058ft). On a very clear day, we should be able to see Mount Kilimanjaro in the south, Mount Elgon to the west and Indian Ocean to the east. We descend to Shipton camp for main breakfast and soon after, descend to Old Moses for the night. Day 5: After breakfast, transfer from Old Moses to catch transport to Nairobi where the tour ends. Day 1: After breakfast, depart from Nairobi and have an overnight stay in Nanyuki town. Dinner and overnight provided. You have time to acclimatize. Day 2: After breakfast, leave Nanyuki for the park gate to start climbing to the first hut, Old Moses 3,300 m.
Day 3: Have a long walk (5-7 hrs) to the second hut Shiptons (4,200 m), for acclimatization purposes. Day 4: Hike through Simba Col via the tooth to overnight at Austria Hut (4,700 m). Please note this base camp is only used when climbing through the normal route. Day 6/7: Attempt points Nelion and Batian. (5,195 m). Early rise and start are recommended. Descend to Meteorological station for overnight on the 7th night. Day 8: Descend further to Park Gate for your transfer to Nairobi.